Every living being is special thanks to the nature of its life that makes it unique and beautiful in its own way. There is no exception, every life is a tapestry of stories with incredible details that bring the spark of excitement in our souls. This category is a place where you’ll find out some of these exciting ornaments at the life tapestries of primitive dogs. Dogs are man’s best friend. Including best hunting buddy! The best thing about hunting with dogs is watching them do their work. It’s amazing to have a bond with another animal that serves you with incredible senses. Fetching ducks are one thing, battling an old boss hog is totally another! The Shiba Inu is a small Spitz type dog originating from Japan. Together with the Akita Inu, this is definitely the most famous Japanese dog breed in the world. Well, that is not hard to guess, considering how truly awesome, appealing and cute Shiba actually is. Indeed, this is a type of dog that will literally put a smile on your face at first sight. The Shiba Inu is small, attentive, lively, and quirky, with a lovely, fox-like look and cute gaze. This dog is also incredibly loyal, highly intelligent, brave, tenacious, alert, agile, and proud. He is literally the embodiment of good spirit, boldness and alertness, which is the reason he is so prized in his native land. On top of that, the Shiba Dog is very clean and likes to take care of himself, which makes him suitable for almost all living conditions, including apartments. However, though it might seem this is an obedient, calm family pet, that is actually far from truth. The Shiba Inu is one of the most stubborn, independent and least trainable dogs you can find. Besides, he is an independent thinker, which will test your will to the limits. So yeah, in order to put one of these in its place, you will have to dedicate a lot of time to its training and socialization. Now combine all of this and it’s perfectly clear that this is an irresistible dog with an unbreakable will and kingly mentality. With that being said, it is time to take a look at our list of ten most interesting Shiba Inu facts. 1.) The Shiba Ken is one of the oldest dog breeds in the world. In fact, it is a basal breed, which means that it predates all modern dog breeds, and is probably the most ancient of all dog breeds originating from Japan (Akita Inu, Kai Ken, Shikoku, Kishu, and Hokkaido). The Shiba descended from the dogs that accompanied the first immigrants (Jomon-jin or Rope-Pattern People) to Japan around 7.000 BC. The shell midden left by the Jomonjin contained bones of small dogs that were similar in structure to those of modern Shibas. Around 2.000 BC, another group of immigrants came to Japan with their dogs. These dogs interbred with the descendants of the Jomon people’s dogs, and produced Spitz type dogs with physical characteristics reminiscent of nowadays Shibas, such as the pointed ears and curved or sickle tails. For this reason, the Shiba Inu is considered one of the ancient dog breeds – a group of dogs that includes the oldest and most primitive dog breeds in the world, such as the Siberian Husky, Samoyed, Chow Chow, Saluki, Akita Inu, Alaskan Malamute, Pekingese, etc. 2.) The name Shiba Inu translated from Japanese means “Brushwood Dog“. “Brushwood” is a term in Japanese for a sort of bush or tree whose leaves turn prominently red in autumn. With that in mind, we can assume that such name probably refers to the most prominent color in the breed (red), or it actually hints to a type of bushy terrains in which Shibas‘re used to hunt. However, in an old Nagano dialect, the word Shiba means “small“, which also makes sense because this is the smallest of all six native, distinct Japanese dog breeds. That’s why the Shiba Inu is sometimes referred to as the “Little Brushwood Dog“. 3.) All Shibas in existence today actually descended from three bloodlines that survived the WWII, during which the breed was at the brink of extinction due to huge distemper outbreak, bombing raids and shortage of food. These strains were the Mino Shiba (Gifu Prefecture), the Shinshu Shiba (Nagano Prefecture) and the San’in Shiba (Shimane and Tottori Prefectures). The Mino Shibas were recognizable by the thick, pointed ears and sickle tails, which are not that common in modern day Shibas, which usually have curved tails. The San’in Shibas were larger than most modern day Shibas, and were usually black. Black-and-tan Shibas you can find today probably descended from this bloodline. The Shinshu Shibas were the most similar to modern Shibas in appearance and size, and were recognizable by curved tails, very dense undercoat, and short, red topcoat. All three strains were later merged into a single breed, the Shiba Inu. Lively and strong-willed, always ready for some action! 4.) The first Japanese breed standard (the Nippo Standard) was published in 1934. In 1936, Japan declared the Shiba Inu a National Treasure, thanks to the Nippo (Nihon Ken Hozonkai), the Association for the Preservation of the Japanese Dog. Today, this is the most popular and most numerous companion dog in Japan. 5.) Though Shibas are now mostly used as companion dogs, that was not the case in the past. Indeed, these dogs were bred primarily for hunting back in the day. They were notorious for their tenacity, endurance, fearlessness, agility, resourcefulness, and loyalty, which are all qualities needed for an outstanding hunting dog. They were used to hunt all kinds of game (big and small), including wild boars, bears, birds, rabbits, etc. They were equally good at flushing the game as well as keeping it at bay. So yeah, they were highly skilled and capable hunters, much prized in their native country. However, this is the main reason Shibas can never be trusted in the company of non-canine pets. They are natural born hunters, who won’t hesitate to chase and kill anything small and hairy, including cats, hamsters, rabbits, etc. Also, watch your birds too! 6.) Like all other native Japanese breeds, the Shiba Inu is incredibly loyal and devoted to his family. This dog will literally live for his family, and will give his life to protect them. As a proof of Shiba‘s loyalty, there is an interesting true story from Japan. 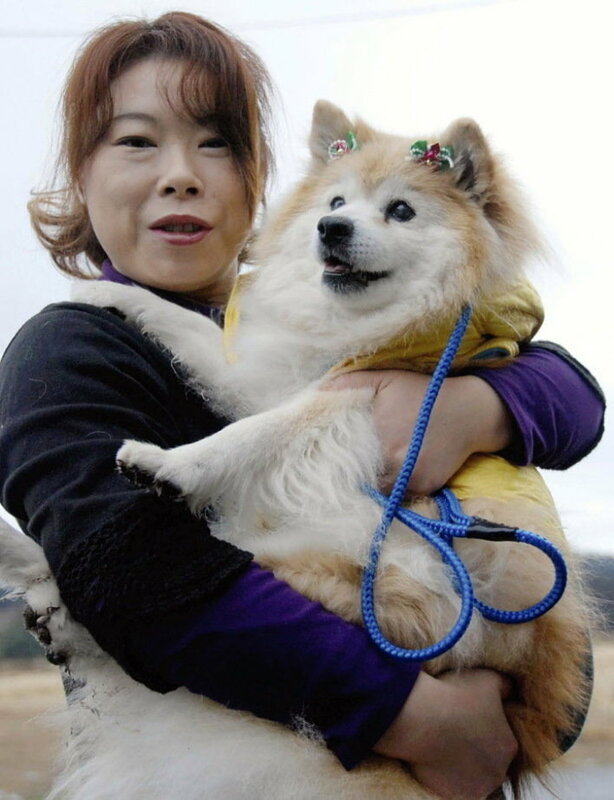 Namely, after the 2004 Chūetsu earthquake a Shiba named Mari sought out rescuers in the village of Yamakoshi (now part of the city of Nagaoka) and led them to the house of his family, which was completely destroyed. Rescuers started the excavation immediately and saved an elderly man and his daughter (Mari‘s owners) from the ruins. This just proves how loyal and affectionate Shibas truly are. 7.) Cute little devil! The Little Brushwood Dog has larger than life personality. He is overconfident, independent, freethinking, and stubborn as a mule, which makes his extremely difficult to train, especially for inexperienced owners. And not just that, he is also incredibly grumpy, cheeky, strong-willed, and possessive of his own things (food, toys, etc.). That’s why the Shiba Inu is prone to aggressive issues, such as aggression with other dogs, food aggression, and aggression toward humans. Early socialization with different things is a must to prevent such behavior issues! 8.) One of the most authentic characteristics of this breed is the so-called “Shiba scream“. This is a type of weird, high-pitched scream that is incredibly loud. A dog usually produces it when provoked, unhappy, mistreated, or just out of pure joy, especially when he meets his master after being separated for long. It can be scary or funny at times, depending on the situation. 9.) The Shiba Inu is an escape artist with a master’s degree! If bored or left alone for long, this dog will literally pull of some marvelous tricks (like a little Houdini) in order to escape. He is incredibly agile and flexible, and can easily climb over fences and squeeze through narrow holes. He is also an excellent digger, and can swiftly burrow under fences. On top of that, he is capable of biting through leashes with ease. Now combine this with his brilliant mind, and it’s perfectly clear the Shiba can’t be confined just like that. That’s why it is mandatory that you always supervise your Shiba and spend as much time as possible with him. This also applies if you keep your dog indoors. Sure, he won’t escape thus easily from an apartment, but he’ll discover other ways to deal with boredom, such as destroying your furniture, chewing things into pieces, etc. 10.) The Shiba Ken is a very healthy breed, with an average lifespan ranging from 12 to 15 years. The most common health problems in the breed are allergies, glaucoma, luxating patella, hypothyroidism, hip dysplasia, entropion, and some forms of cancer. However, none of these is in the category of major concerns. One particular Shiba, called Pusuke, lived up to 26 years and 248 days. A dog died in December 2011 and, according to the Guinness Book of Records, was the oldest dog in the world from December 2010 up to his death. As of 2011, Pusuke is on the 10th place on the list of the oldest dogs ever recorded. His owner, Ms. Shinohara, said that Pusuke was active and fit up to the day of his death. This just proves how restless and lively this breed actually is.